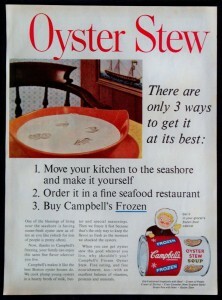 My Mom used to buy Campbell’s Frozen Oyster Stew for us to share at lunch. She didn’t do this often but it was a huge treat when she did. This buttery, creamy, slurpy soup with those funny rubbery fishy bits … I loved it. This is really an odd sort of choice for my land-locked, Southern Ontario farming Mom. I wonder how she got “hooked” on this soup? Why not, if it is going to be a fishy stew, the more popular and known clam chowder? Anyway – I quickly learned to love it too, at a relatively young age. And I do crave it from time to time. It hasn’t been available for years, unfortunately, and I wouldn’t know the first thing about trying to make it from scratch. The only oysters I know of are expensive appetizers in upscale restaurants in Toronto. I suppose there are tinned oysters but I can’t imagine putting them in a soup. I woke up with this soup on my mind and, alas, had none available. I did have granola, Greek yogurt and a fresh peach so I made do with that. 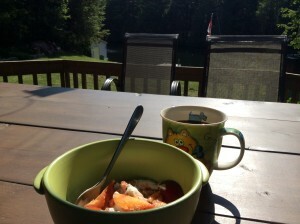 Granola, yogurt, peach and coffee. An oyster stew substitute?